When the rogue-lite genre was getting a bit old, simple and easy, Harebrained Schemes were plotting a…scheme. To make one of the harshest and deadliest roguelike games out there, Necropolis. This game is HARD, straight up, and it’s most recent update “BRUTAL EDITION” adds plenty of goodies, game balancing, improved AI, new weapons and armor, and a whole new playable class, the Brute. How does the game hold to what it promises? How fun is the multiplayer? And in it’s current state does it really has what it takes to be a full fledged hard-a** roguelike? Let’s get down to the Necropolis to find out. The game starts you off by allowing you to choose between a fast and agile character or the Brute, once you’ve made your decision you hop into the Necropolis, where a weird intelligent eye being narrates your adventures in a dark humorous way. In the Necropolis, you will find many halls, doorways, passages and of course many, many enemies that are hostile, and their spawns as well as the whole level’s flow, are re-made every time your character dies. Layouts can get repetitive after a while; although it’s very appreciated that the environment is not only 3D on X, but also the Necropolis has floors as the game’s sense of progression once you finish a level. This adds to the game’s level design depth to a certain extent. Also in cases you can find hidden ladders to catwalks or jumping puzzles to help traverse a map quicker or find hidden ways to explore. 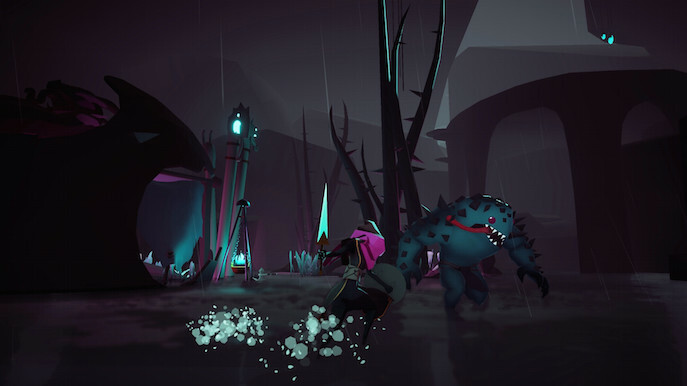 Eventually you will get sweet changes of scenery every level in terms of design, color palettes, unique routes and each level offers a decent roster of enemies designed specifically for the environment. 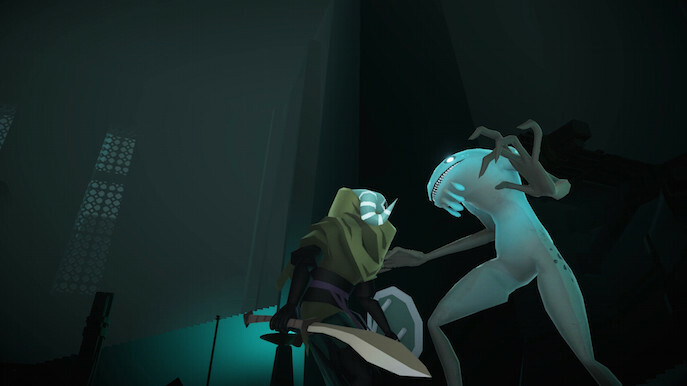 Both the rogue-type character and the Brute have a set of attacks, a regular one, a heavy and a jumping attack. While the rogue is agile and moves faster, he/she gets hurt harder, while the Brute is pretty much the complete opposite, having a dodge animation that is quite slow, barely useful unless you time it right, but hey! You can pretty much just walk by vases for easier loot collecting. 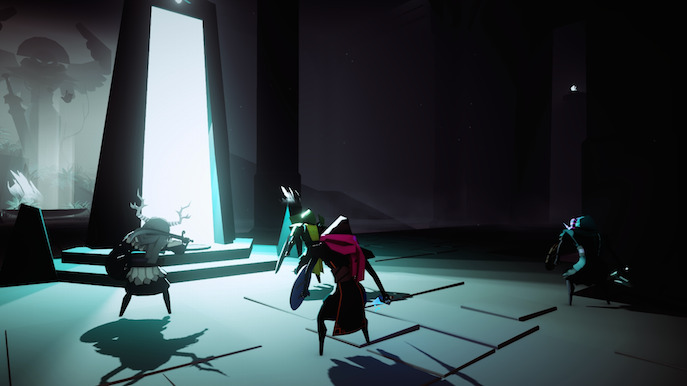 Gameplay requires to kite and aggro much more than it should due to its difficulty, enemies can group up and overwhelm you easily if you’re not careful. Attack swings and overall maneuvers use a generous and fair amount of stamina, all while trying to get used to shaky and fast camera movement that after a while one does get used to it. But not all is violence! Your main source of healing are huge cartoony meat, you start with a very few amount but some vases (there are a generous amount of vases and destructables with loot around the levels) have a chance to drop more. Not eating food at a fair pace will cut your stamina bar harshly, so keep that in mind. Eventually, you can find these sorts of libraries (the Scriptorium) when you finish a level, where you can read a special book that will teach you interesting abilities. Some of the abilities will a allow you to bypass certain obstacles in the map. Checking corners or halls and sometimes find chests with more loot and sometimes better ‘equippables’. Sometimes something, or someone can pop out of the chest and not necessarily attack you, but sell you stuff! Unique vendors help even more with item versatility, and not all come out of chests, try checking on peculiar things, like vents. In an funny DMC style way, you will encounter red crystal walls that spawn enemies, this seems to be one of the toughest encounters in the game, and yes, you guessed it, you can fight through the red enemies. Do be aware of where you step, the crystals can trap you into position for a while. Once you prevail, rewards can be found! 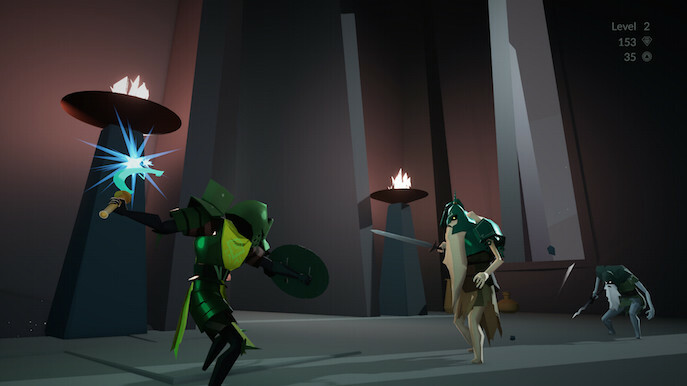 Defeating enemies allows you to loot their weapons, both swords and/or shields, which can provide special elemental effects or specific stat changes which adds to the game’s versatility. At the end of each level, you will find a sort of Hub area with a merchant and a magical well that can upgrade your life bar and replenish your health in exchange of gold. Each upgrade being more expensive than the one before. It is really appreciated how items have funny descriptions, accommodated to the game’s humour. They also have a fair amount of text to let you know what they do. In cases however, Potions with weird and strange effects can be found, some literally even say “An unknown Potion”, so it will either stay in your inventory the whole way through or go ahead and, drink it? Inventory has a fair size, allowing you to switch between your preferred items. Most types of ‘lootable’ things are also crafting materials. The game let’s you go into the crafting menu and craft simple healing items, potions with side effects or bombs that are not as strong as you-d expect them to be. If you think the crafting is limited, you can also find recipes around the world or purchase some from merchants, did I mentioned that even some of them sell the famous RPG scroll, the scroll of identification, for identifying…unidentified stuff. It’s a simple surprise factor in this genre I suppose. The one thing that bothers me a bit is how you don’t really know how much damage you’re doing to enemies, they only flash red when struck, so it isn’t very fun to have to count the number of strikes, on specific enemies, on specific weapons, on specific tiers. Enemies don’t have life bars! Playing this game alone can truly become a test of endurance and patience. It is obviously much harder this way. Fortunately, co-op alleviates this immensely. In character customization is pretty much color changing or whether you want to play as the normal character or the Brute (both with male and female options). During your adventures you can find and unlock dyes for cool color designs. Sometimes you can find new armor as well that changes your appearance for the time of the run or until you switch it for something else. The cool thing about this is that when playing with friends it makes it easier to make yourself somewhat unique. 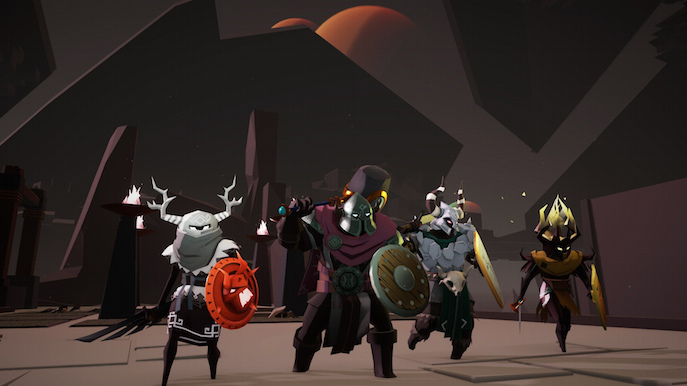 When in multiplayer, you share gold earned as well as milestones that you can aim to achieve casually without a problem whether they be defeat certain type of enemies or craft certain things. 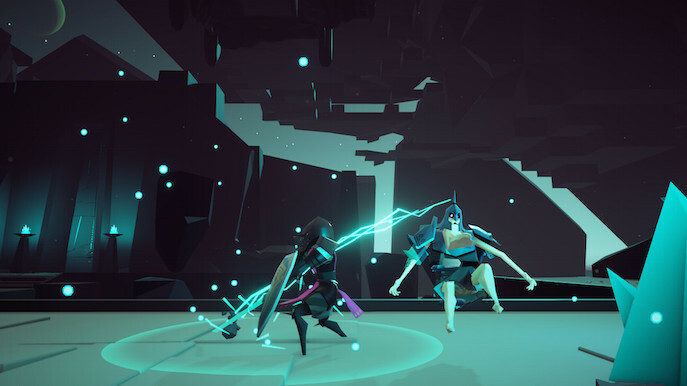 Co-Op really makes the game much more entertaining, as aggro is focused not only on you, but on your friends! Strategies and tactics can be implemented to achieve goals and defeat all enemies in specific rooms. But there is always a “But…” and that is ‘Friendly fire’, this forces you to keep a distance from your allies when there are a lot of enemies just in case someone has a long-range weapon equipped. This one factor feels like it really isn’t necessarily and only subtracts the fun out of the multiplayer mode. Having there a lack of a minimap, you can still track your fellow teammates with a cursor in the UI, also with the help of the always useful ‘player name indicator’. It’s helpful but then again it’s always nice to stick close. In either case that one of your friends is defeated, you can res teammates with a very generous HP recover, although not always does the button prompt sync properly with the character model. If you don’t res someone, he/she can rejoin back to your team but with Tier 1 equipment. A great perk from the vast level design in terms of route branching allows for teammates to go their own paths and get their own loot, not worrying about others grabbing something you or someone else may want. NetCode seems to be very well done, character models respond quite nicely and Friends can join in easily. However you require a decent Internet connection, otherwise you will sometimes see your teammates sliding against corners, or the whole syncing issue with resing. Being able to leave a party will also save your progress to that specific run, which really helps when you’re not the sort of players who is not into the whole “starting over” mechanic, or simply need a break from the harsh environments of the Necropolis. 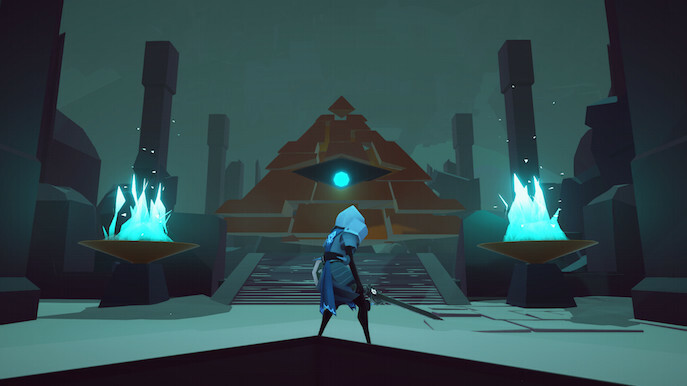 The game runs with a popular low-poly 3D models art style, which has a nice and simple aesthetic that gives more contrast to particle effects and lightning. 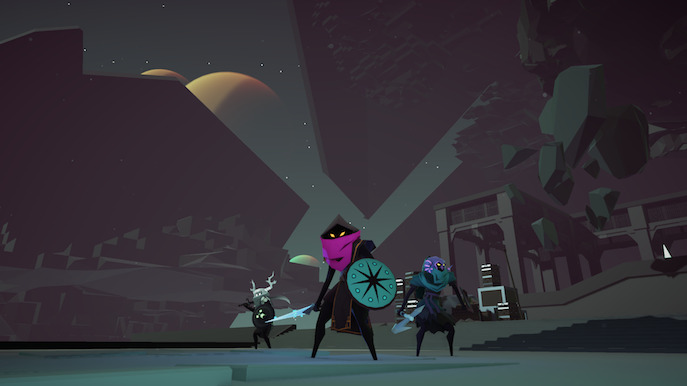 Character models look unique and the enemy variety is fairly decent, especially for each sort of level. One of the nicest touches is how it uses this low poly technique to do subtle texturing to surfaces. As for the music, it is a nice mix of sinister and dark humour that revolves around the whole theme of the game, very well though out and resembles pretty much what the game is. Even though the game has gone through a huge update, it really does feel like the game needs another 33% of content, in terms of playable characters. It may be possible that there is some sketches for a sort of magical character, so having a spell casting character into the roster would make even more parties, but then again devs’ should revise the friendly fire mechanic. Necropolis: Brutal Edition is a dark and violent experience that contrast with its peculiar tone. A game that feels like it’s getting closer and closer to become one of the most tense & dark ambience indie games.